"Healthcare is hot. Tech is hot. Put them together and you have a sector that generates a lot of enthusiasm in the investment community." Source: The Healthcare Technology I'm Most Excited About. By Motley Fool. November 16, 2014. The quote above accurately depicts what is going on in healthcare right now. There are lots of ideas, but there will be few staggering successes. One company is going to come along that will be disruptive and will change the landscape. Perhaps it will come from someone's garage. That company will have new proprietary technology that does NOT need onerous regulatory approval. For example, there are 450 Electronic Health Record companies(http://www.skainfo.com/press_releases.php?article=122). Most of these companies are going to fail. But if one company comes along that has better technology than all the others it will become dominant. A dominant healthcare website could get 500 million visitors a month based on the number of unique visitors to all the top healthcare websites now. "The best investors consistently reap gigantic profits by recognizing true potential earlier and more accurately than anyone else." Healthcare professionals' clinical experience treating a disease does not always correlate with what the medical literature says. This may happen, for example, when the medical literature lags behind an extremely successful new medical treatment. It may also happen because studies are difficult to do, expensive, and time-consuming. Thus, the medical literature may lag behind clinical experience, sometimes years behind. “Every day, patients...are faced with crucial health care decisions while lacking key information that they need.” – Patient Centered Outcomes Research Institute. Patients need patient engagement. Patients need shared decision making. Imagine wanting to research a medical treatment. When our vision is realized, you will be able to go to TreatmentScores.com, find a diagnosis, and see a list of every treatment ever mentioned in the medical literature all arranged from best to worst by their Treatment Scores™. We will be doing a new kind of medical review article. The Treatment Scores™ will be based upon our evidence-based medicine algorithms. You will be able to click on the Treatment Scores™ to see the supporting statistics and medical references. 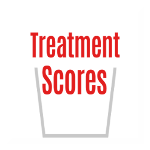 Knowing Treatment Scores™ will empower you and educate you. We will analyze Western medical treatments, Eastern medical treatments, herbal medicines - any treatment that has data. We quantify the science of medicine behind medical treatments, which used to be impossible. It used to be impossible to quantify baseball as well, but Sabermetrics was invented and led to a World Series victory. Basketball is now being quantified using the Pythagorean expectation to the 14th power. Medicine can be paternalistic; you were told what treatment to undergo. Shared decision making is better. Treatment transparency is better. Post Internet, medical knowledge mostly relies on subjective review articles. You cannot see the specifications of your healthcare treatments in the same way that you can see the specs of other products. Many healthcare consumers don’t understand things like statistical power or P values. Many inadequate statistics exist such as hazard ratios, relative risk reduction, and the number needed to treat. We have invented new statistics focusing on what is most important to the patient - statistics that may be of life and death importance. We create true treatment transparency that is easy to visualize. The information on this website should never be used as a substitute for the advice of a qualified, licensed physician or health care professional. We are a new way to write review articles. We are not advocating any treatment, physician, medication, or any other entity. We are informational and educational only. We do not form physician-patient or doctor-patient relationships. Contact your physician for medical treatment. Call 911 if you may have an emergency or go to the Emergency Department. We are not responsible for any delays in care from information obtained from our site, nor for any consequential damages of any nature whatsoever, either directly or indirectly related to the use of this site, or from assumptions made. We cannot predict the future, we are only trying to do a better job of quantifying and reviewing what has happened in the past. Personalized medicine means being able to write out the personalized diagnosis. Evidence-based clinical decision making begins with being able to be as precise as possible. Personalized healthcare is the future. We must use health information technology to provide better product transparency for the individual patient. We can do this now, because of new inventions, and because of the intersection of new technologies. The solutions to product transparency (treatment transparency) are Treatment Scores™, Treatment Grades™, and Science of Medicine (SOM®) Scores. “The volume of evidence, especially clinical guidelines, has become unmanageable."